Today we are going to explore an Asian home that shows us just how gorgeous a simple home design can be. Designed by professionals Home Style Toto, this contemporary home takes minimalism and modernity to a whole new level. You'll also see how the designers have created different perceptions throughout the architecture thanks to innovation and creativity. The result is simply breathtaking. Are you keen to learn a few advanced architectural and design techniques? From the get go, we can see that this isn't a modest home The modern design, clean lines and sheer size pack quite a punch! 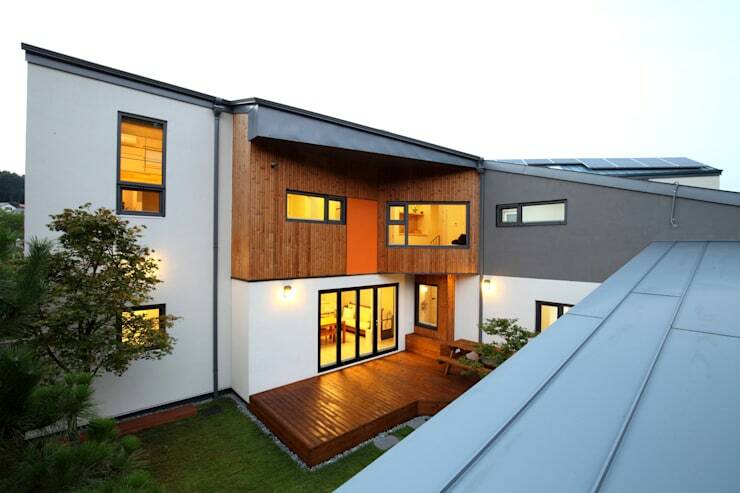 The double-storey home takes on an L-shape and features a mix of materials and neutral colours, tones and textures. 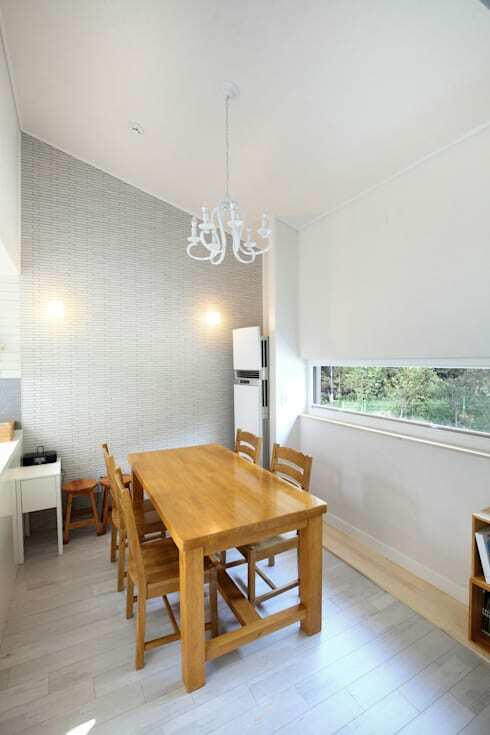 Smooth white and grey plastered walls contrast with gorgeous wooden cladding. 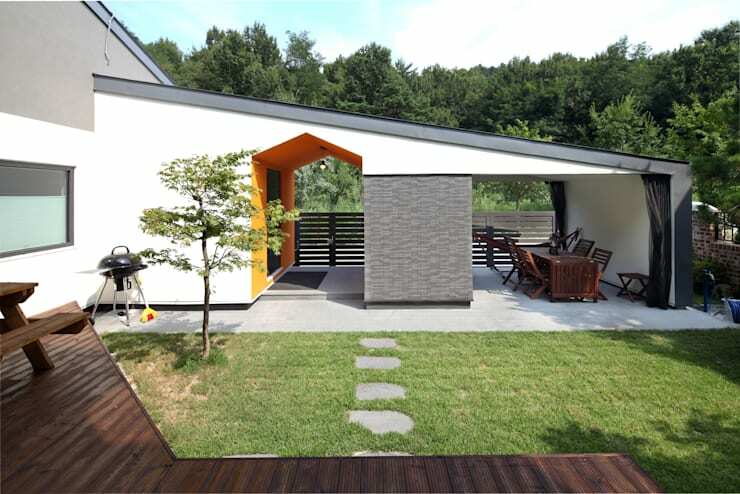 The L-shape design keeps this little garden and terrace area protected from prying eyes, while allowing the family a beauitful outdoor area to relax and enjoy fresh air and sunshine. Tip: Wood is great for a terrace as it is durable and looks gorgeous! 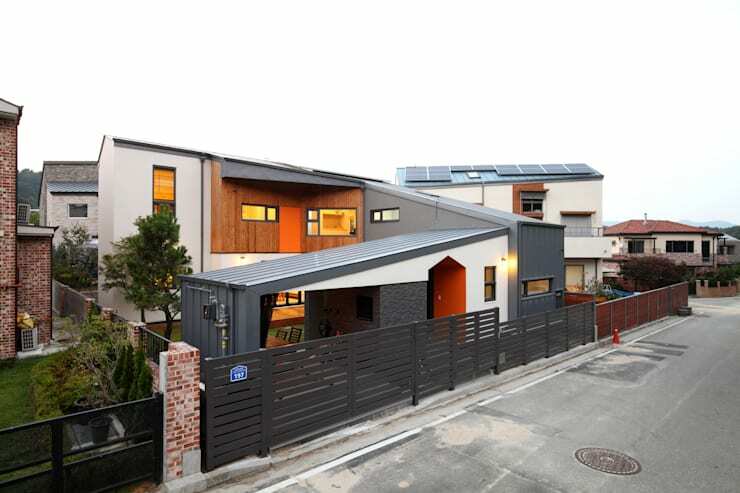 From the street, we can see that this home is surrounded by a beautiful grey fence, which keeps the home neatly packaged in terms of the exterior look and feel. Do you see how the brick pillars add texture and tone to the design? From this angle, the home takes on many different shapes, forms and perceptions. The designers have used geometric lines to create an extraordinary piece of architecture. We also get a little glimpse of a splash of orange! 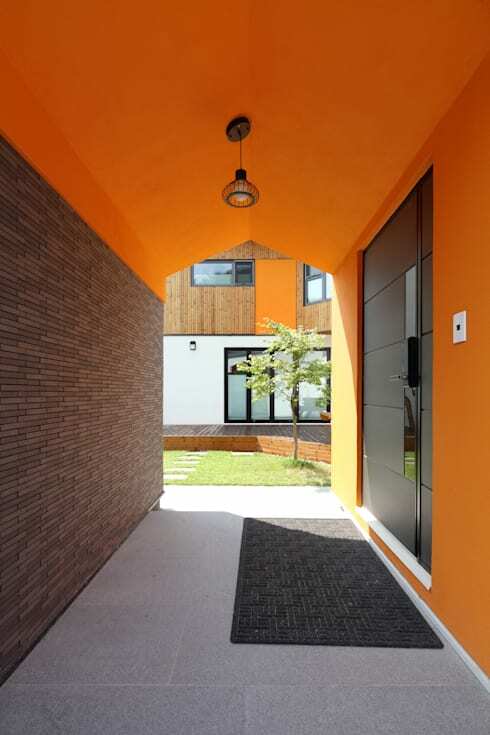 The designers have painted some walls a bright orange colour, which brings a beautiful and bold touch to the exterior look and feel. You'll notice that it's just a few walls here and there, which is enough to add vibrancy without overwhelming the appearance. In this little tunnel, we come across the entrance to the home. A smooth dark wooden door complements the orange walls, while the raw brick wall adds an industrial chic touch, introducing texture and tone to the environment. Remember that your entrance is the first impression that people will get of your home so you want it to be stylish and welcoming. Not only is this entrance stylish but the large welcome mat and lamp that hangs from the ceiling creates a very warm and functional design. 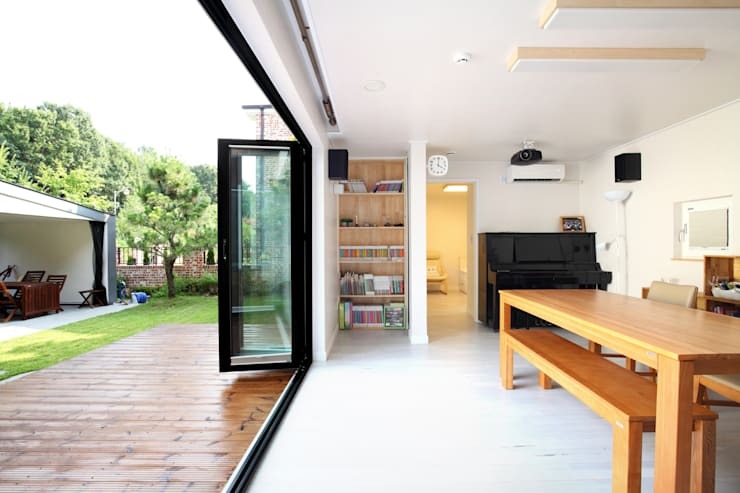 In this image, we can see how the interior and exterior spaces are interconnected, creating a beautiful flow between open plan areas as well as a constant connection to nature. 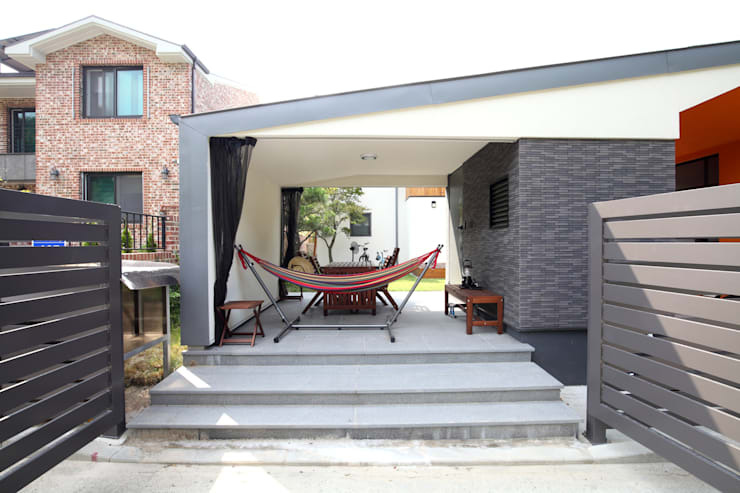 This little outdoor area is covered and features curtains, so that it can be turned into an indoor space if need be. With a hammock and outdoor dining room table and chairs, this is the perfect area for entertaining family and friends or even hosting an outdoor barbeque. It could also just be used for relaxing with a good book or taking an afternoon nap. From this angle, we can see how the spaces that we've just explored fit together. Do you see how the different shapes and volumes make for an extraordinary piece of architecture? Do you also see how the gorgeous garden connects to these spaces and how the little garden path leads people through it? Have a look at these tips for your own garden path: Step forward to a great new garden path. The interior design of the home is very simple and minimalist with clean lines, neutral furniture and predominantly white tones. The designers have ensured that everything that isn't functional is stored neatly out of sight. 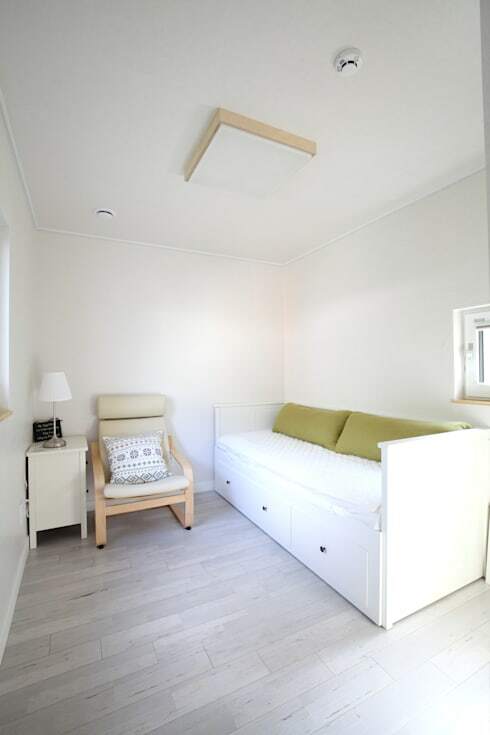 The result is a pristine home that is simple yet very stylish and chic. Do you see how the white, black and white tones work together as well as how natural light plays a role? This little living room area is another great example of minimalist design. The designers have gone for white tones in this space too and have used cushions to add a little bit of colour and personality. This is a great tip! Another great idea would be to add a fresh vase of flowers or a pot plant. 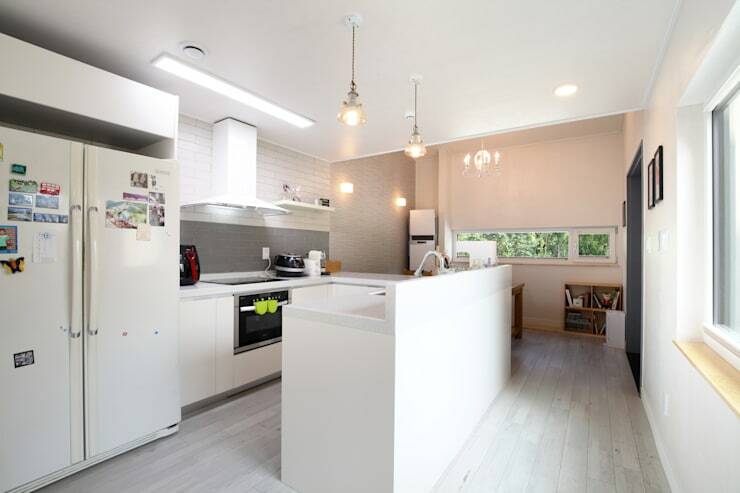 It's worth looking at the kitchen too, because of how wonderfully it is designed. The little kitchen island in the middle of the room provides this space with extra storage and an extra surface area for cooking and preparing food. The predominantly white design is very effective, creating a very clean and hygienic look and feel. Do you see how the functional lights have been used to bring a beautiful ambiance to the space? The kitchen is connected to the dining room, creating a wonderfully social and interactive home. This means that while the chef is cooking, family and friends can relax at the dining room table and interact. The light wooden furniture gives an antique touch to this modern home, while the chandelier introduces a sense of luxury and charm. Once again we can see what a big role natural light plays in this home. We end off our tour in the charming bathroom, which features skylights and windows throughout, creating a very naturally light and bright environment. This isn't a very large room, but the designers have worked with the space available to them to create a very multi-functional environment. 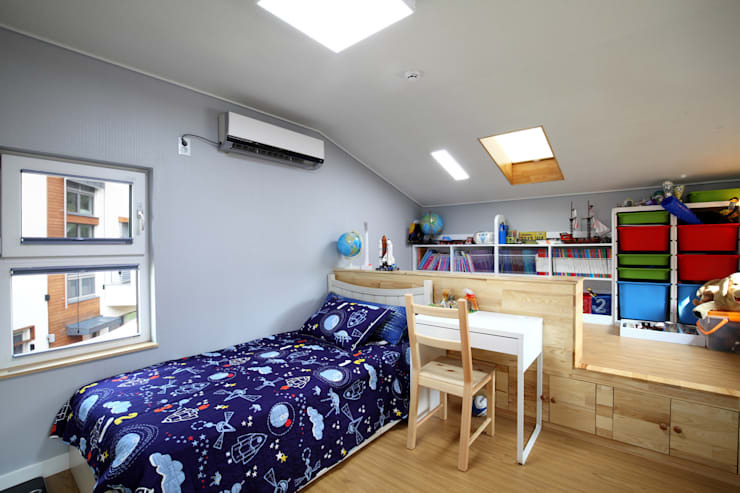 A set of shelves keeps books and toys neatly stored away while still on display while a desk and chair has been slotted next to the stylish little bed. If you've enjoyed exploring this home, you'll love this one too: A Minimalist Home Full of Personality.